Why Form a NAR Section? Why Form an NAR Section? There are several reasons why it is attractive to become a chartered Section of the National Association of Rocketry. The most important one is social: all of us have started out in the hobby of rocketry by purchasing a kit, building it, and flying it. Fun at first, but it gets old after a while. You need a buddy, or several friends, to fly with. You build models, compare their looks and performance, talk rockets – in short, you have more fun when it’s a group activity. Being part of a NAR Section gives you a sense of camaraderie, and gives you access to the ideas and enthusiasm of others. This makes everything you do with rockets more fun – every launch, meeting, or get-together. Forming a NAR Section is the best way to find and get together with like-minded people. Clubs also have greater financial resources than individuals, and are able to obtain expensive or specialized equipment that individuals could not. Insurance coverage. Through the NAR, you obtain free liability coverage for your Section and for your launch site landowner. These policies provide coverage for rocket-related accidents, and their associated personal and property damages. This insurance coverage makes it easier to get launch sites, run launches, and conduct demonstrations. This insurance isn’t just “more affordable” through the NAR — it’s practically unobtainable anywhere else. Backing for Dealing with Government Permits. By working as part of a team backed by the insurance and credibility of the NAR, you can navigate the government regulation bureaucracy for important permits such as an FAA Certificate of Waiver or Authorization for high-power flying or a local fire marshal permit to fly rockets on a particular site. Experienced Support. NAR Sections have many NAR volunteers supporting them. Our Section Activities Committee can help both new and established Sections. They have experience in getting launches and demonstrations organized. They are in continual contact with other committees within the NAR that provide services to members. Finally, they have a lifetime of experience to answer questions you might have. Grants/Funds for safety equipment, launch equipment, and publicity efforts. National Competition. NAR Sections can compete in our national contest structure for the title of National Champion Section. Someday, your members may end up on the top of the competition heap. The drama and fun of competition rocketry can fully involve you and your NAR Section as you go onward to the NAR’s own Super Bowl: NARAM, the National Championship Contest! Contact the Section Activities Committee. The Committee can supply you with a list of NAR members in your state upon request. A direct mailing/e-mailing to these members could well generate all the members you’ll need to form a Section. A simple note to the prospective members is your best bet, telling them who you are, what you want to do, and why. Invite them to an organizational meeting at your house, or any convenient meeting place. Contact local hobby shops. Most hobby store owners will be valuable sources of information. They often have customers ask if there is a rocket club nearby. Most hobby store owners will let you put up posters or distribute flyers in their shops. It’s good business for the owners. They know that the members of a local rocket club are ready-made customers. Some will even give club members a discount, and special-order merchandise for rocketeers. It pays to maintain a good relationship with hobby store owners. Put up posters and flyers. Posters and flyers in public places that are likely to have lots of traffic from the target population you are looking for (normally parents with 4th through 8th grade kids and/or people who go to hobby stores) can be a cheap and effective means to advertise your club. Remember the “Three C’s” when creating posters – Colorful, Clear, and Critical. Colorful means steer clear of plain old white poster board with black lettering. Opt instead for colored poster board and/or colored text. Graphics help to draw the eyes of your intended audience. Try including some photos of launches, meetings, or construction sessions. Avoid the “crash & burn” shots, and try to show people smiling. Family shots can be quite effective, too. Clear means to keep your poster uncluttered. A few graphics or photos are great, but too many can detract from your message. If you are forming a new Section, the posters should include information about your organizational meeting. This is where you’ll actually form the club, and it’s important to make the first meeting a good one. An obvious point, but often overlooked, is to put your name and phone number on the poster or flyer! You do need to know how many people to expect. Critical, of course, refers to critical information. As mentioned above, make certain that you include all of the information needed by your prospective members – Where is the meeting? Who should attend? What’s it all about? When is the meeting (date/time)? Check for existing rocket clubs. Sometimes there is already a functioning rocket club in the area in a school or a youth group such as 4-H or Scouts that has never heard of the NAR. If they are open to expanding their membership outside their current community, then this can serve at the nucleus of a new NAR Section. Hold a demonstration launch. If you already have a couple of friends with whom you fly, but do not yet have enough people to be that “critical mass” to form a good Section (remember that it only takes two NAR members to form a Section! ), then you can try to build your starting core with a public demonstration launch. This takes good publicity; some equipment (particularly a multiple-pad launch system so you can fly at a fairly fast pace to hold interest); a public address system or bullhorn so you can get your message out to the spectators; and some form of crowd control (flag line, etc.) to keep the spectators at a safe distance from your launches. Remember to have publicity fliers to hand out, and have a signup sheet for people who are interested in being part of your group. Finding a launch site that is close to lots of people where you can get permission to fly before you have NAR site owner insurance might be tricky; try working with a school or hobby shop as your sponsor. Hold an open meeting. 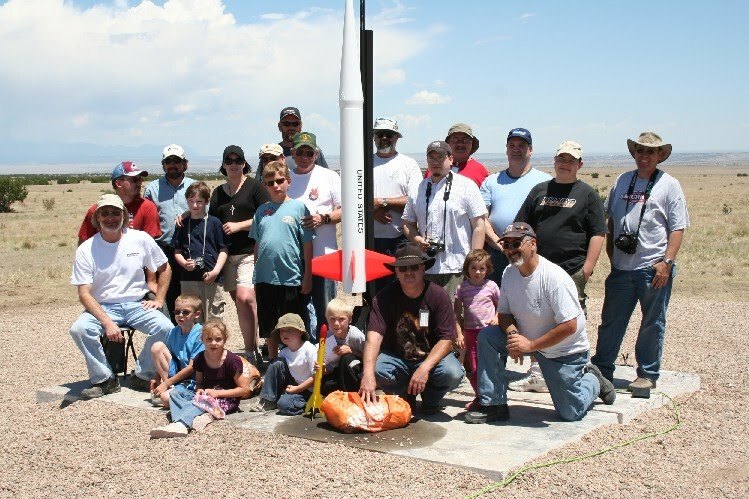 If you can get some publicity going but cannot find a good place to do a public demonstration launch to draw initial interest, then try holding a public meeting at a community facility (library or civic center meeting room, or school) to attract people who might be interested in starting a rocket club. Have lots of “show and tell” rocket stuff at the meeting to make it interesting for those who may choose to attend. You must have at least two (2) NAR Members to charter an NAR Section and five (5) to renew the charter once the Section has been active for two or more years. At least one member must be a Senior (adult) member. This Senior Member is invaluable in assisting a club through the maze of legalities and local government contacts during its operation, as well as dealing with merchants, a bank, and other officials. Your club may choose to accept “associate” members who are not NAR members, but these members cannot officially belong to your Section and they gain no insurance benefits through your club. When you’re ready to charter, fill out the online Section Application Form carefully. The contact details that you supply for your Section will not only be used by NAR Headquarters for official business, but they will be provided to other clubs and people in your area looking for a Section to join. Help us put NAR members in touch with you by providing correct address, phone and e-mail information. Also, make sure these people can be reached and are responsive. There is no fee for chartering a NAR Section, for renewing a charter, or for getting a Section insurance certificate for your launch site landowner; it is all FREE because you are a member of the NAR and we think that Sections are important! Your application will be processed as soon as we receive it. A Section number will be assigned and your Section will also be added to the list and map locator of NAR Sections on the website, which is updated regularly. You will receive a confirmation email from the Section Activities Chairman welcoming your Section to the NAR as well as providing you with additional information. At that point, you will be part of an official NAR Section! Please note that due to the mechanics of our insurance policy, all insurance certificates expire on April 4th with a new policy becoming effective immediately and issued to all active Sections. Landowner copies are also reissued automatically to all active Sections. Section Charters also expire at the beginning of April so the Section renewal process typically starts mid-February and is handled online. Reminders are sent to all Section Contacts via the email address on record. Once you have enough people interested in forming a Section, you must hold an organizational meeting. See the “Management” page for details on how to do this. This meeting will be the formal kickoff for your NAR Section. Here you will put up a formal structure for the club and write its By-Laws — the rules for conducting club operations and business. You should publicize this organizational meeting, using the same methods described above. If you used posters, flyers, or a demonstration launch prior to forming the Section, you may have already advertised this meeting. If not, it’s time to put up the posters and print up the flyers telling everyone about your meeting. If your publicity methods got the names and addresses of rocketeers in your area, touch base with these folks. Give them a call, see if they’re still interested — shoot the breeze about rockets, and remind them of the meeting. You can also get ideas about your club from those interested before the meeting as well. If you only have an address and can’t find a phone number in the book, try a mailing. A postcard with the date, time, and place of the meeting, plus a person and phone number to contact will work well. It’s also cheaper than a letter. Next, do the “posters and flyers” bit again. There may be modelers who missed your first run of publicity. Don’t deny them the chance to get involved. There will be a lot of work and a lot of fun for them to participate in, so get the publicity machine working again. It’s also a good time to touch base with the hobby shop owner. Let him know how things are progressing. He may have ideas that will help. If your club is mostly youngsters, choose an adult leader to run the first meeting. An adult is more likely to keep things under control, and often has experience getting things organized. They should be able to keep the meeting moving toward its objectives. It’s all too easy to fall into shooting the breeze about rockets instead of getting the club organized!